In a community called German Village, there should be a German restaurant or three. We’ve got Schmidt’s Sausage Haus, which has been a German Village landmark for decades, we’ve got Valter’s at the Maennerchor, and now we’ve got the Alpine German Restaurant and Bar, which opened recently in the building formerly occupied by the Juergen’s Restaurant and Bakery. On Friday night Kish and I had our first dinner at the Alpine. We figured a cold winter evening was a good time to try the place, because we’d only have to walk a few blocks to get there and because, let’s face it, German food is well suited to frigid temperatures. The Alpine has a snug little dining room — I’d recommend making reservations if you’re going there for dinner — and offers a full range of German fare. That means lots of different meat, potato, cheese, and bread dishes. It’s what my grandmother would have called “stick to your ribs” food. 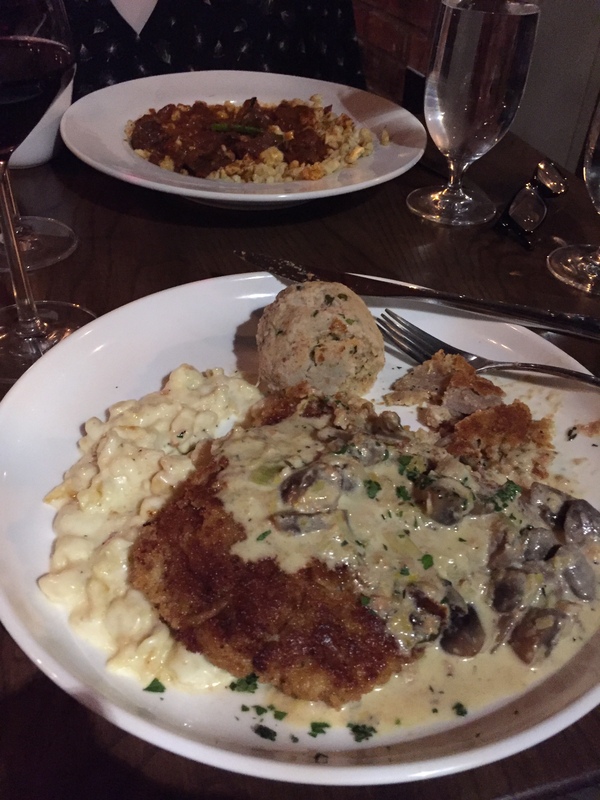 I’m a traditionalist, so I went for the veal weinerschnitzel with mushrooms, cheesy spaetzle, and a bread dumpling. The veal was lightly breaded and tender, the spaetzle was like macaroni and cheese nuggets, and the bread dumpling was delightfully moist. It was the kind of meal that encouraged you to get as many items as possible onto your fork and into your mouth at the same time, and it went perfectly with a full-bodied glass of red wine. I ate every bit of it. Kish got a cucumber salad and the goulash, which was too much for her to finish. She took home the rest and I happily reheated it and had it for lunch on Saturday, and it was great, too. I’m pleased to report that, after careful deliberation, we decided not to have dessert, because we’d already maxxed out the carb meter and wanted to demonstrate some semblance of moderation. But I can also report that, with that meal under our belts, we were properly fortified — you might say Alpinized — as we walked home in freezing temperatures. Sometimes, you just want something quick over the noon hour. Yesterday, work demanded that the New Mentee and I get back to our desks promptly, so she suggested that we head to the Elia Athenian Grill. It’s in one of the storefronts along High Street near the corner of Broad and High, where a lot of food places have come and gone in recent years. Unlike some of its predecessors, Elia has shown some staying power. Elia Athenian Grill is designed for the busy worker who is not going to be lingering over lunch. You order at a counter, choosing from four base options — a pita, a salad, a grain bowl, or a “mixed bowl” — and then you identify toppings to be added as you move down the line. By the time you reach the cashier and pay your food is ready and you grab your tray and head to one of the nearby tables. I went the pita route, and had them assemble a pocket of “chicken yeero” — chopped chicken, helpfully presented on the menu in phonetic fashion for those of us who always wondered exactly how “gyro” is pronounced — with onions, feta cheese, and tzatziki sauce. And, because the preparer behind the counter said it was “traditional,” she added a few french fries on top. I’m not sure that french fries are in fact traditional Greek fare, but the meat was good, the sauce added a pleasant zing, and adding a few fries meant that I got a reasonably limited exposure to french fries without have to deal with a mound of them. In short, the pita was good, and filling. The New Mentee went for something called a Power Green Mix salad, which featured kale, romaine, spinach, chards, and cabbage, hummus, olives, some kind of non-meat substance that looked like meatballs, and God knows what else. There was a lot of leafy green stuff in that bowl, so I tried to avert my eyes and not give it too close an inspection. Clearly, the New Mentee needs mentoring in the food department! Nevertheless, I did observe that, after eating about half of the Power Green Mix, she walked back to the firm, clutching her carry-out bowl, with a demonstrably more powerful stride. Elia obviously has a solid core of regulars; the Bus Riding Conservative came in when we were there and no doubt grabbed a Power Green Mix to consume at his desk. And the New Mentee was right — we were in and out in 45 minutes, easy. Elia Athenian Grill is a good option if you’re in downtown Columbus looking for something speedy . . . or a Power Green Mix. The Ringside Bar & Grill is one of the oldest establishments in Columbus, dating back to 1897. Also known to those of us of a certain age as Clem’s — the name of the gruff, cigar-chomping boxing fan sitting at the bar who ran the place for years — it’s a modest brick structure in Pearl Alley, tucked in behind the Rhodes Tower and the other buildings fronting Broad Street. These days the Ringside is also one of the unlucky businesses shrouded by the massive scaffolding apparatus surrounding the Rhodes Tower, where lots of exterior work is being done. The Ringside has exercised a little self help, decorating the concrete abutments for the scaffolding to direct patrons to the front door and hanging signs on the scaffolding itself to remind people that the Ringside, and the other restaurants in the alley, remain open for business. Yesterday a group of us decided to hit the Ringside on a rainy day. Inside, the place is a snug joint that has the warmth and pleasant feel of an Irish pub, with the kitchen on one side, the polished wooden bar on another, a row of wooden booths against the wall, and some tables in the middle. I always feel right at home at the Ringside. And the place always serves a very fine burger, too. Yesterday I went for the patty melt, and I got a piping hot, juicy burger on crunchy toast, dripping with melted cheese and sauteed onions, served with kettle chips. It was excellent, and left me well nourished for the afternoon’s work. I hope patrons don’t let the scaffolding deter them — the Ringside is right there where it always has been, ready to dish out one of the very best burgers in downtown Columbus. Sometimes, you only need to look at a menu to determine whether a place is likely to be good, or bad. When it comes to a BBQ joint, you’re looking for a menu that is brief, and preferably written on the wall rather than on laminated menus that are handed out to patrons. That’s because, if you’re turning out the highest quality barbecue, it’s got to be the exclusive focus of your efforts. You can’t be wasting time worrying about creating new salads, special soups, or other, lesser items. Yesterday we ventured out of the downtown area to try the offerings of Smoked on High. I’d heard about SoH from several friends and the word of mouth was very strong, so when the Red Sox Fan suggested yesterday that we give it a shot I was all for it. We drove, because it was pelting down rain — a daily occurrence this August — and SoH is located just south of downtown on High Street, in a converted house located on the border between German Village and the Brewery District. SoH passed the BBQ menu test with flying colors. According to the options posted on the wall on the entrance to the order area, you can choose from brisket, pork, chicken, or ribs, a handful of sides, and three sauce options. Oh, and yesterday chili was available as a special. It was a visible demonstration of commitment to barbecue, and nothing but. Of course, I went for the brisket sandwich, with mac n’ cheese and cornbread as sides. When I ordered the brisket the cook pulled a virgin slab out of the oven, glistening with a great char, and sliced it up for my sandwich. I was given my food, had decided to try the spicy and mustard and vinegar sauces, had paid for the combo, and was headed to my seat in a few seconds. The speed was appreciated, because after looking at the meat I was definitely eager to dig in. The sandwich was terrific — the meat was awesome, and the Red Sox Fan aptly noted that the bun was appropriately substantial to hold up against the weight of the meat piled on it — and the mac n’ cheese and cornbread were delectable, too. Although it was a very close call, I decided I prefer the mustard and vinegar sauce. Smoked on High is a short drive from downtown, but it’s also just a short walk from our house in German Village. I’m pretty sure I’m going to become a regular. Pecan Penny’s is the new BBQ joint in downtown Columbus. It’s located in the old Ray Johnson’s Fish Market building on Main Street, between Third and Fourth. Yesterday, JV, the Unkempt Guy and I decided to venture forth into an end of July downpour and check it out for the first time. The set-up at Pecan Penny’s is different than at most restaurants, but familiar territory for barbecue aficionados. You order at the counter from a menu posted on the wall, take your tray to go fetch your drink, and before you know it your order appears and you find a table, inside or outside, to sit down and eat. The delivery of my order took about the blink of an eye, and I got my food before I’d even filled my water glass. If you’re interested in something quick, Pecan Penny’s is the place for you. Oh, and the barbecue is pretty good, too. I got the brisket with mac and cheese, which also comes with some toasted bread and a large homemade pickle chip. I doused the meat with some Hot Grandpa sauce — apparently a PP staple — in honor of JV, whose going to be a grandpa here soon, although of a decidedly lower temperature. The brisket was moist, smoky, and quite good, with the HG sauce adding a nice zing to it. The mac and cheese, which is infused with crunchy bread crumbs, was very tasty indeed and a great complement to the brisket, and the toast was good, too. I ate everything except the pickle chip and enjoyed it all. JV got the pulled pork and baked beans and gave them an enthusiastic thumbs-up, and the UG also enjoyed the brisket. During lunch the UG regaled us with tales of his home barbecuing and meat-smoking prowess, but the fact that he got some kind of cucumber-oriented side dish made me question his true barbecue bona fides. Really, UG? Cukes, rather than mac and cheese or baked beans? I shake my head in dismay. By the way, Pecan Penny’s has a very pleasant, informal atmosphere, with a nice wait staff, too. There is a bar area, a front of the building patio, and a back of the building fire pit. 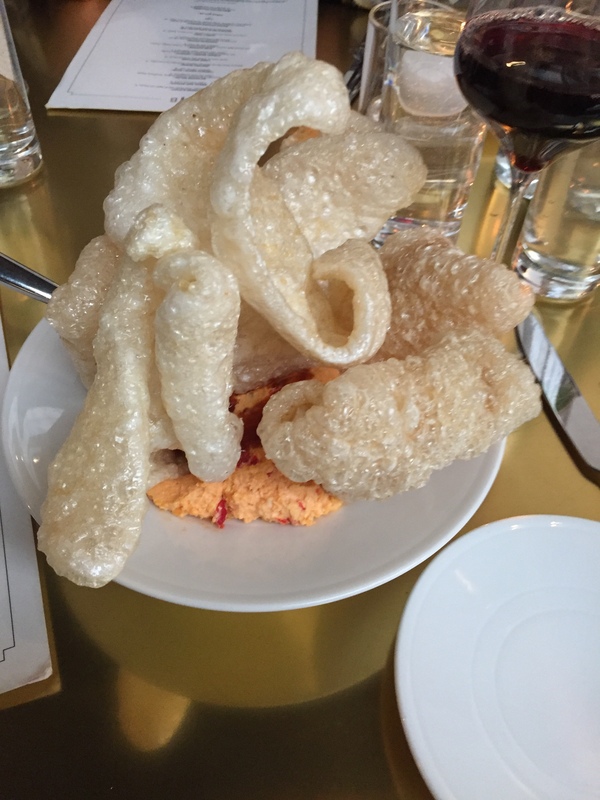 It has the laid-back, relaxed vibe that makes you think it would be a good place to hang with friends, eat a little charred meat, and enjoy an adult beverage or three. The lunch crew will definitely be back.